I’ve been a fan of Kilowog since his first appearance (which, for those who aren’t aware, was AFTER the Crisis on Infinite Earths, when the GLC was just seven guys in California) and I’ve always enjoyed his antics. In recent years, he’s become an amalgam of pig, squid and R. Lee Ermy in ‘Full Metal Jacket,’ and has even cheated death itself. 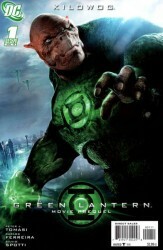 Leading up to the big film debut, Kilowog gets his own one-shot, and I have to say: It’s about time. Because I Am Hard, You Will Not Like Me! The More You Hate Me, The More You Will Learn! That very line is indicative of the dual problem behind this comic for experienced readers: It goes over territory that an experienced GL reader will already be aware of, and it does it in a rather talky, expositionary style. 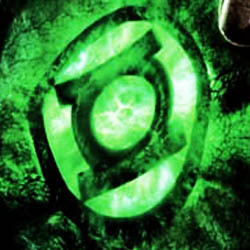 We see bits and pieces of Kilowog through his trainees eyes (and they talk about it), we see a young Lantern with precognitive powers trying to warn the Guardians of an oncoming threat (and they talk about it), we see a training exercise where the young Lanterns have to act decisively and follow orders to survive. They fail (and they talk about it), only to have Kilowog dress them down for their inexperience, following the only action sequence in the entire book with a full-page speech about the meaning of the Corps and their chest symbols, and how they need to work together againt major threats, which to be fair IS a different interpretation than old GL comics, where collaboration between Lanterns was discouraged. 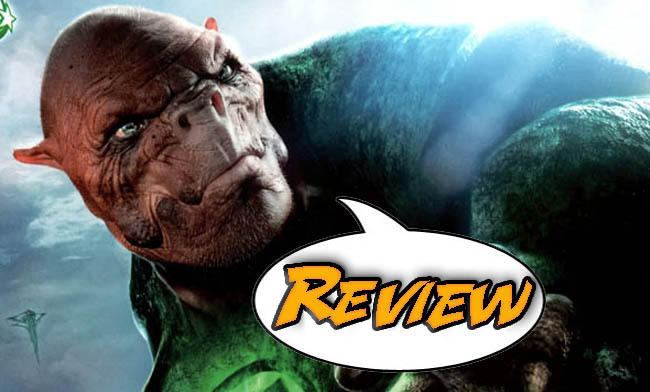 We close with more talky-talky, as Tomar Re arrives to let Kilowog know that his mentor has died on a strange faraway planet… A world called Earth. I’m always leery of comics like this one, simply because their job is to lead you into the specific short-term story that is the movie origin of Hal Jordan. The point is to give you the lay of the land and explain how what you know is being interpreted in the framework of the story being told, and as such it may be forced to ignore the niceties of comic book storytelling. In an attempt to get everything in, writer Tomasi chose/was forced to couch the book in a lot of narration and explanation. It’s successful in giving us information, but nothing here makes me want to desperately rush out in a buying frenzy to watch the Green Lantern movie. The overall design work is interesting, trying to capture the over-elaborate designs of the aliens, the Guardians (who do look more impressive than their comic counterparts) and the alien planets, but the art itself ends up being pretty standard, and the closing shot of Kilowog and Tomar is awkward as all hell. All in all, this book can’t be expected to be the equivalent of Superman Annual #11 or Spider-Man #123, but I can be a bit disappointed in the tone of the completed project: Green Lantern Movie Prequel: Kilowog #1 is a competent, if talky, lead-in to ‘National Lampoon’s Van Lantern’ which will probably be much more successful among the greater audience it’s aimed at, earning 2 out of 5 stars overall. Faithful Spoilerite Question Of The Day: Why is it that comic book costumes adapted to screen always end up being dark and lumpy-looking? I always thought that these kinds of books were designed as gateway drugs for movie fans to become interested in the medium of comics. I met Kilowog when his mouth and face looked more like a cross between a runt hippopotamus and a steam-shovel! This “Piggy-faced Swamp Thing” better look and act like the “Once Greatest” and D.I. that he is supposed to be among the Lanterns. Otherwise… why is he in the movie? I’m tired of movie directors “scanning” decades of comics and picking out a few “outstanding” villains/sidekicks… then making them almost unrecognizable on film. Ironman II… was that Whiplash? And “Bucky” will be HOW OLD in the new Captain America movie?!? “Angel” in X-Men First Class?!? The next Batman movie will have a female “Robin” who runs really fast and carries a red, white, & blue shield… and a really big Nordic green hammer that shoots webs!! !